Ubin gave me a lecture about the Newar people of Nepal when he gave me this recipe. They are the indigenous people of Kathmandu and the largest ethnic group according to the 2001 Nepalese census. He grew up eating chataamaris–what he would translate as rice crepes–and drinking San Miguel beer to match. 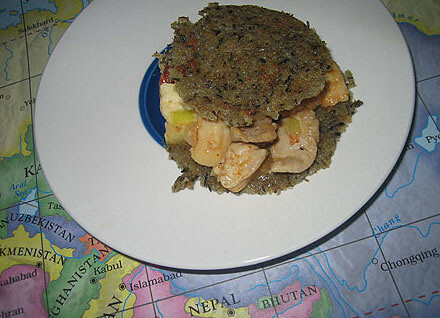 He claims that Newari food is the best cuisine in Nepal but grounding the rice and lentils was laborious. I can imagine that a powerful mixer or blender would have been beneficial to use instead of my old-school mortar and pestle. Dal is what the Nepalese use to refer to lentils, split and skinned. But they also use the term for all peas and beans that go through the process. Split lentils don’t hold their shape well, so they’re usually used for purÃ©es. I bought a package of black beluga lentils from Whole Foods. Even though the instructions said I didn’t need to soak them, I did anyway to follow the recipe. I also found a block of paneer cheese at Whole Foods. I also found it easier to make the chataamaris separately and serve the stuffing on the side instead of making them empanada style like the recipe originally suggested. We ended up tearing the chataamari and eating it like bread, scooping and soaking up the chicken while we ate. 1. For the chataamari, soak rice and black lentils in water overnight. Rinse the soaked rice and lentils mixture thoroughly. Using a mortar and pestle, ground mixture into a smooth batter-like paste, one small batch at a time. Pour into a large mixing bowl and add cumin seeds and salt to taste. Mix thoroughly and add more water as necessary to keep that batter consistency. Let the batter rest for at least six hours, covered, in the fridge. 2. When ready to prepare, take out the batter from the fridge and let it come down to room temperature. Make the stuffing. Heat oil in a skillet and sautÃ© garlic and ginger until light brown. Add chicken with some salt and pepper. Brown the meat under medium-heat. Add chilis, tomato, cheese and scallions. Stir for a few minutes in low heat until the chicken is thoroughly cooked. Add salt and pepper to taste. 3. To assemble chataamaris, heat a tablespoon of clarified butter in a large non-stick skillet over medium-low heat. Pour in some batter and spread out into a paper-thin crepe. Cook until the bottom has crisped up. Scoop some of the chicken stuffing and add on top of one side of the chataamari. Using a heat-resistant spatula, turn over the other half of the chataamari to cover. Turn and cook the other side until crispy. Repeat until you finish the batter. which whole foods did u buy the black lentils. i can’t find them anywhere. One can compare it with food from nepal.